Wednesday, March 22- I had expected a full house; I mean this is Yellowcard we’re talking about. What I was not expecting was the 45 minute line wrapping all the way around the parking lot. Saying Yellowcard played a full house is an understatement. They sold out the entire Marquee Theatre. 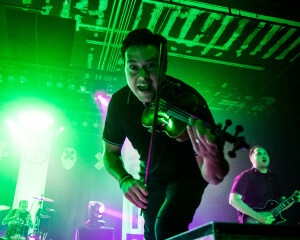 The Final World Tour for Yellowcard did not disappoint. If you look at my notes from the night, one phrase will pop up more than any other…A+. They kicked off the night with an opener and a throwback: Sean O’Donnell. He is, as he would describe, “the world’s fifth favorite ex-member of Yellowcard.” With silky vocals and an acoustic guitar, O’Donnell had the audience wrapped around his finger. Even though he was a stark contrast to main act, everyone loved him. Having O’Donnell as the opener was the perfect nostalgia to top of the final week of the final tour, ever. Not to mention the duet between him and Ryan Key. The two have been playing music together in a variety of bands since they were 19, so it was great to see them play together one last time. Black out. Crowd goes silent. A voice plays over the speakers. “Ladies and gentlemen. Welcome to the final tour.” The voice proceeded to sass every person in the audience for watching the show through an LED screen rather than the miracle of the human eyeball. Needless to say, it made a difference. Yellowcard has been together for 20 years and it shows. Not only have they had all that time to practice, but they have one of the strongest bonds I’ve seen to date. Excellent chemistry and interaction with not only each other, but the audience as well. They ate it up. Energy was flowing both ways, getting stronger with every note. The air was thick with hands; clapping, flashing devil horns, and throwing fists up as high as they could go. Rock and roll was in that room, no question. What made the show so spectacular though, was the fact that the band was actually playing music together, not just the same song at the same time. Vocals and guitar, syncing to the bass behind it all. The drums paired with the violin seamlessly. 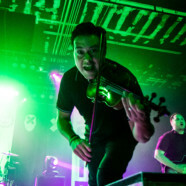 In case you didn’t know, Yellowcard’s violinist, Sean Mackin, is a total badass. I never thought a violin could be so hard rock. He certainly proved me wrong. The band had a goal by the end of the night; every audience member was to wake up the next morning without a voice. “Make up the words if you don’t know what they are, but whatever you do, don’t stop singing.” Ryan Key, lead vocalist said. As one can probably assume, with only three shows left to do it, they achieved their goal.